Recruit Holdings Co., Ltd. has agreed to purchase Workopolis.com. Indeed, the world’s number one job site and a subsidiary of Recruit, will operate Workopolis.com as part of its publisher network. The site will continue to operate in a similar manner. If you have set up a job alert, you will continue to receive that job alert from Workopolis.com, as you requested. 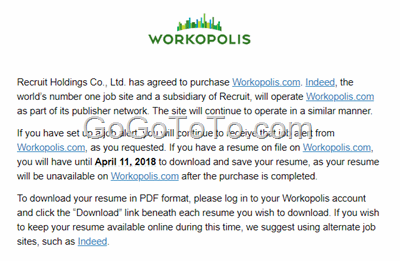 If you have a resume on file on Workopolis.com, you will have until April 11, 2018 to download and save your resume, as your resume will be unavailable on Workopolis.com after the purchase is completed. To download your resume in PDF format, please log in to your Workopolis account and click the “Download” link beneath each resume you wish to download. If you wish to keep your resume available online during this time, we suggest using alternate job sites, such as Indeed. So if you have resumes on Workopolis, please login your account and just download your resume. When we login to our Workopolis, we realized the website only kept one resume for us, we have had multiple resumes on their site actually, don’t know what happened. Anyway, Indeed purchased Workopolis, looks like it is a good to all of job seekers. Be careful ! Employment (job) scam.